Every homeowner know it’s a bit overwhelming when they host friends. Apart from all the mingling and food they have to prepare for, they also have to make sure that none of their guests spill wine on their carpet. This is because spilling wine on the carpet can be a stressful ordeal. It’s difficult to remove wine and may often mean the end for the damaged carpet. Salt has been found to be an effective tool to quickly get rid of wine stains on your carpet. Spread the salt liberally over the stain and allow it to dry before washing with cold water, baking soda or detergent. After that, the stain will be gone. This is because the salt manages to soak up the stain like magic. It’s important to note though that salt is not entirely effective on all stains. You can pour club soda over the wine stain so that it can effectively get rid of the stain much quicker. There have been some users who say that it’s best to apply club soda first before applying salt onto the stain. Sometimes, the club soda is enough to get rid of the stain. But if you still find some traces of wine on your carpet, you can add the salt and leave it to dry. Although there are many who swear by the solution of using salt or club soda, there are many others who advise against it. Instead, the best substitute is to use a little bicarb soda on the stain and wringing it out with vinegar. The trick here is to absorb as much liquid as you can from the fresh stain on your carpet with paper towels. When you can no longer get liquid off the stain, sprinkle some bicarb soda on the carpet. This will turn the stain from red to pale gray. It’s advised, however, to avoid using too much of the ingredient. After this, the next tip is to wring out a cloth in white vinegar and use this to wipe the affected area. Leave to dry before vacuuming. If the above two options do not seem to work, your next option is to try cleaning the area with a mixture composed of 3 parts Hydrogen Peroxide, 1 part Dishwashing Liquid. The technique here is to pour the mixture on the stain and allowing it to sit for a while. As you see the liquid area start to disperse, you can add more of the solution and let it sit for a while. You no longer have to rub or scrub the stain since the mixture is able to do its job. All you have to do is wait. 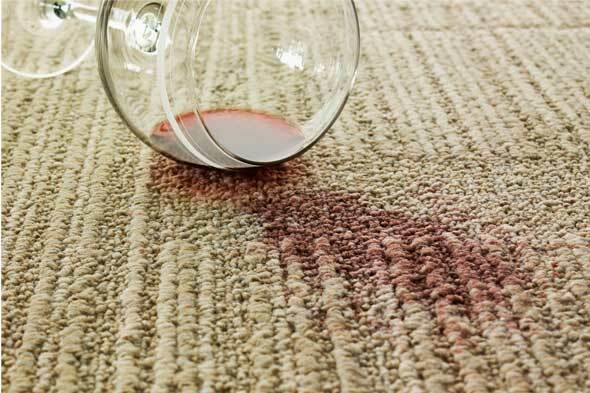 One of the easiest ways to get rid of wine stains on your carpet is to pour the area with near boiling water through the fabric. The technique here is to stretch the area over a bowl so that the water will fall through the fabric and into the bowl. This option, however, is only best for colorfast and sturdy fabrics like tablecloths. It might not work as well on thick carpets but it’s worth a shot. If you’ve tried any of these options but still can’t get rid of the stain on your carpet, another option is to bring your carpet to a professional cleaner. They have the right tools and expertise to clean your carpet so that it will look like new once again.